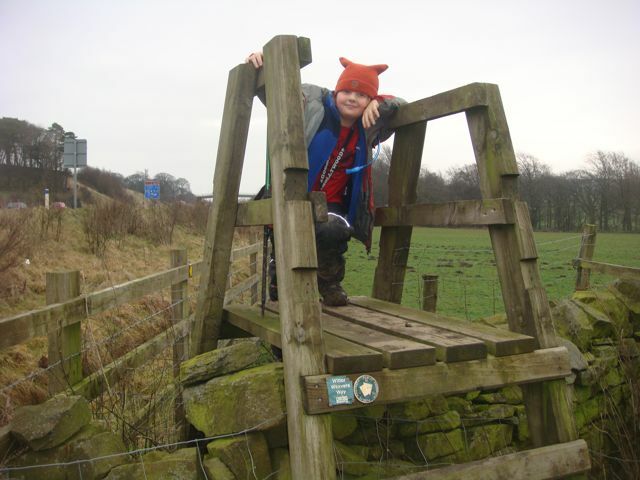 On Saturday we returned to the Witton Weavers Way to try two more parts of the walk. After wimping out on the Reelers Trail last weekend, we just *had* to do it this weekend! We parked up opposite the pub in Abney Village. I was actually going to park by the pub but thank goodness I did not as I’d not read the note about them clamping people. After kitting up, we set off to do the Reelers Trail in a clockwise direction. A nice easy walk down to the stream at ‘Torrent’ with a couple of easy finds to get us started on the trail. The Torrent cache was a lot harder as the GPSr’s had us some way from the bridge and after searching all around, we could not find the cache. A quick look at the previous logs and we spotted something that took us to by the bridge and an easy find. After walking up the steps, it was quite muddy making our way northwards on the trail, but not too bad – especially if we kept on the main track and did not off-road. Several more quick finds had us going through the farmyard. There was some sheep with newly born lambs in the barn by the path. As we approached, we could see the farmer and his wife in there, tending to their animals. The farmer shouted over “do you want to come and look at the lambs, young lady” to Isaac. LOL – his longer hair has it’s disadvantages at times ;-). We carried on, past the flagship cache and up towards the canal section. Lots more quick finds on a really great walk. We’ve come to expect this from L E G E N D.
We were getting hungry by now, so stopped to sit on a wall just south of the M65 and ate our soup and sandwiches. Suitably fortified, we set off to finish the series. The bit around Tockholes was a bit of a dog’s dinner as the trail veered off the Witton Weavers Way, along some poorly signposted Public Footpaths. I’m guessing this had to be like this because of the existing Tockholes Treat series of caches though, so no problem. Our favourite part of the walk was the Roddlesworth Woods part as it’s such a nice place. More easy and quick finds followed, before we arrived back at the Jeep. We then drove round to pick up the straggler caches on the trail: one on the other side of the canal towpath at the top end of the route, followed by another easy one along a track near Cherry Tree. That’s the Reelers Trail completed now – just time to go and finish off the Roddlesworth Section. We parked by the end of the rough road that headed to the caches and set off on foot for a quick clockwise walk around the 4 caches here. Nothing much to report here, apart from more nice caches, great views and good walking. The flagship cache here was our favourite cache of the day. As we set off homewards, Isaac spotted two quick drive-by’s nearby so we just *had* to go and find them. The first was tricky as the co-ords were way out. After using someone else’s co-ords, we found the cache some 90ft off the co-ords. The last cache of the day was a nice easy one, with some great views over the moors. Another really nice day out doing caches in a great area for walking. We’ll be sad when we eventually finish this series of caches.